Shortly before Google released Android 4.4 “Kit Kat” into the wild, they announced that a change was coming to how the OS tolerated SMS apps. In the past, you could have any number of apps on your phone set to receive SMS messages. From the stock messaging app to third party beauties like Sliding Messaging, the whole SMS world was wide open and a free-for-all of sorts. 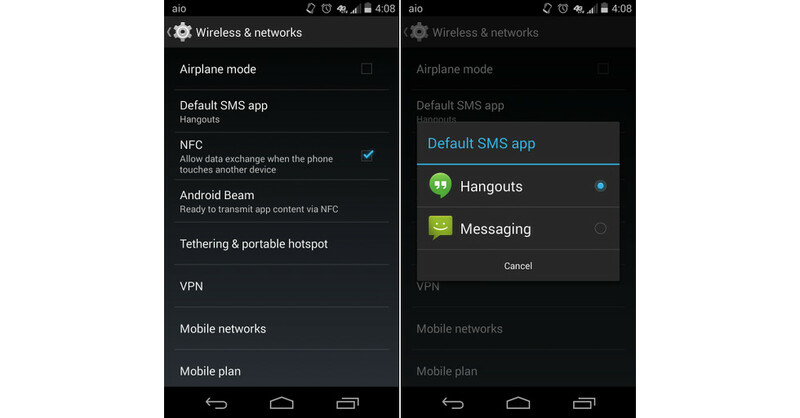 So with Kit Kat, Google has tried to tighten that all up by limiting the OS to allowing one app to essentially send and receive SMS and MMS messages. As is the case any time a change like this happens, we want to make sure you know how to handle it going forward. Google has actually built in a system setting for Android 4.4 that allows you to toggle between SMS apps that are installed on your phone, you just need to know where to find it. Let’s open the beginners’ guide and take a look! 1. From your home screen, open Settings and head into “More…” under Wireless & Networks. 4. A window should appear with all apps that could be a potential SMS app. 5. Tap the one you want to use. And that’s that. It’s a simple change, but should you stumble upon a new app and decide that something like Hangouts isn’t exactly your cup of tea, this is where you would go to change the default setting.